The two most common nuisance gnats inside a home are; fruit flies – fungus gnats. Anyone who has battled with either of these can testify to the fact that these little gnats can drive you crazy!!!! The gnats that are the most likely to occur in sinks and sink drains are fruit flies (sink gnats). The breeding and developmental sites for these small flies, often called sink gnats, are varied, but for the most part, include habitats that stay moist and contain decomposing waste components. Eliminating the gunk built up in the drain pipe which is the breeding ground for gnats: drain cleaner (microbial foam that cleans the drain). If all else fails, call us and we can incorporate extra measures in your routine pest control in eliminating the flies. The second type of pesky household gnat is a fungus gnat. There are most commonly bred in houseplant soil. Damp houseplant soil is a fungus gnat ideal habitat for breeding. Infestations are common in potted plants kept outside during warmer months. A fungus gnat breeds rapidly, and large swarms cause all-out war to be declared. The pest’s full lifespan is only about 17 days, but one female can lay over 200 eggs in that time. Because fungus gnats are extremely small, their presence can go undetected until the situation is out of control. 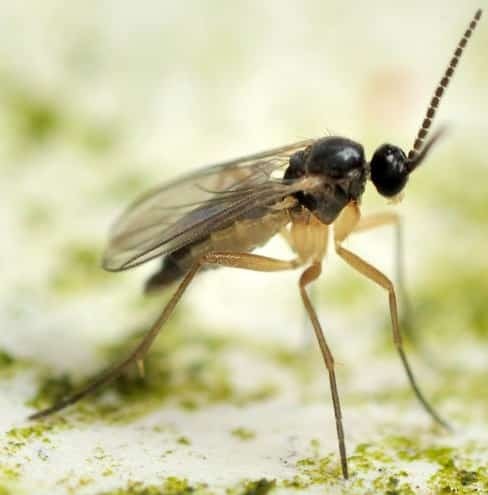 While fungus gnats do not bite people, their larvae feed on mold and fungi found in soil, plus plant roots, leading to wilting. When infested with fungus gnat larvae, plants show signs of stunted development. Through our Integrated Pest Management (IPM) Program, we will devise a program that utilizes all the tools necessary to remedy your specific situation. We will make suggestions that might be as simple as reducing the moisture content of the soil. Overwatering a plant is the most common issue. 1) Hydrogen peroxide: Mix 1 part peroxide with 4 parts water, and pour it through the soil at the root zone until it begins to come out of the base of the pot. The peroxide kills fungus gnat larvae on contact. 2) Neem oil is also an effective soil drench to combat fungus gnat larvae. Dilute the oil with water per manufacturer’s directions and directly drench the soil at the roots of the plant. You can also spray the upper portion of the plant to keep adult gnats at bay. 3) AzaMax is a higher-strength concentration of the active ingredient which naturally occurs in neem oil. It’s safe in hydroponics use as well as in greenhouses, gardens, and indoors. Use it per manufacturer’s directions in the same way you would use neem oil. 4) Pyrethrin sprays are also effective against fungus gnats and their larvae. To use pyrethrins, lightly mist all plant surfaces and the top of the soil. You don’t want the plants dripping wet, a thin mist will be enough. If there are fungus gnat larvae in the soil, spray the soil directly to thoroughly moisten the top, then avoid watering until the soil has dried to at least a 2″ depth. If these organic control measures fail, we can intervene during your routine pest control visit to eliminate the problem. 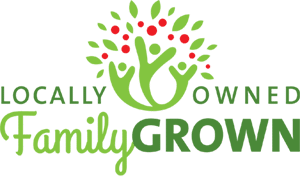 Affordable fungus gnat control. Call us we can help if the situation is out of control.